Each dot represents a pathway and they are colored based on their significance value, red being the most significantly associated with busulfan clearance rate. Among the 200 metabolites analyzed in this study, metabolites involved in the glycine, threonine and serine metabolism pathway are the most significantly associated with busulfan clearance rate. Hematopoietic stem cell transplantation is generally performed in patients with hematopoietic (blood cell) disorders such as leukemia or Fanconi anemia. Each transplantation is preceded by a conditioning regimen treatment to eliminate the patient's own hematopoietic cells in order to create a niche for the newly transplanted ones and avoid immune reactions. One conditioning regimen is through intravenous busulfan administration. Busulfan is an antineoplastic alkylating agent that induces DNA damage and cell death. However, clearance of busulfan by the body is an impediment to reaching the targeted and effective concentration and limits the effectiveness of the conditioning regimen, consequently reducing cell transplantation efficiency. A solution would be to identify some predictive biomarkers to determine the clearance rate of busulfan for each patient beforehand and thus tune the dose of busulfan to maximize the positive effects of the treatment. Recent data from a study led by Dr. Navarro (Public Health Sciences Division) and Dr. McCune (Clinical Research and Public Health Sciences Divisions), demonstrated that the detection of metabolites in the bloodstream could represent an innovative way to determine the busulfan clearance rate of a given patient. "Busulfan has a very narrow window in which it is effective. Dosing has traditionally been based on body weight with serial blood measures to tailor subsequent doses. This is a very time- and labor-intensive process with the initial dose achieving target levels only about 23% of the time. Too much of the drug leads to toxicity, while too little can result in rejection of the transplanted cells or disease relapse", specified Dr. Navarro. Ideal biomarkers should be readily detectable in patient samples that can be collected with minimal invasiveness, such as urine or blood. Metabolites, produced in response to protein activity, are small compounds and meet these criteria. Consequently, metabolite analysis provides information about gene dysregulation and protein activities, giving insight into the pathways activated at the time of analysis. They are also available in the blood and urine, facilitating sample collection. To evaluate the potential of pharmacometabonomics in predicting busulfan clearance rate, the researchers analyzed the presence of 200 metabolites representing over 25 pathways, in the plasma samples of 106 patients prior to administration of busulfan and allogeneic hematopoietic stem cell transplantation. Plasma samples were analyzed using a liquid chromatography tandem mass spectrometry platform to identify chemical components. Set concentrations of known metabolites were also added into the sample runs to determine absolute concentrations. Additionally, busulfan was quantified using gas chromatography in the same patients following the first administration to assess the correlation between detection of certain metabolites and busulfan clearance. 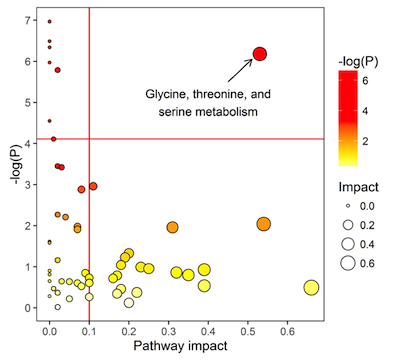 Several metabolites within the serine, glycine and threonine metabolism pathway (P-value= 0.002) were among the most highly correlated with busulfan clearance rate. Glycine is of special interest since it is a component of glutathione, which is involved in the busulfan clearance pathway. Importantly, a previous study from Dr. McCune established that neither gender nor body weight affects busulfan clearance rate. Similarly, gender and weight did not influence metabolites correlated with higher versus lower busulfan clearance rates identified in the present study. The authors plan to analyze additional metabolites to further define the involvement of the identified pathways, with special focus on the glutathione pathway. Metabolites are progressively being valued as predictive tools. Metabolomics has been used to assess allogeneic stem cell transplantation outcomes such as graft-versus-host disease and this study paves the way for more applications. "Our group is the first to attempt to identify biomarkers predicting busulfan clearance in hematopoietic cell transplant patients. We hope to refine our predictive metabolite panel so that busulfan doses can be personalized before treatment begins, and improve overall survival in hematopoietic cell transplant patients" concluded Dr. Navarro. Funding for this research was provided by the National Institutes of Health and the National Cancer Institute. Navarro SL, Randolph TW, Shireman LM, Raftery D, McCune JS. 2016. Pharmacometabonomic Prediction of Busulfan Clearance in Hematopoietic Cell Transplant Recipients. Journal of Proteome Research 15(8), 2802-2811. McCune JS, Bemer MJ, Barrett JS, Scott Baker K, Gamis AS, Holford NH. 2014. Busulfan in infant to adult hematopoietic cell transplant recipients: a population pharmacokinetic model for initial and Bayesian dose personalization. Clinical Cancer Research 20(3):754-63.